The article below is about the old version which is no longer available in Apple’s App Store. 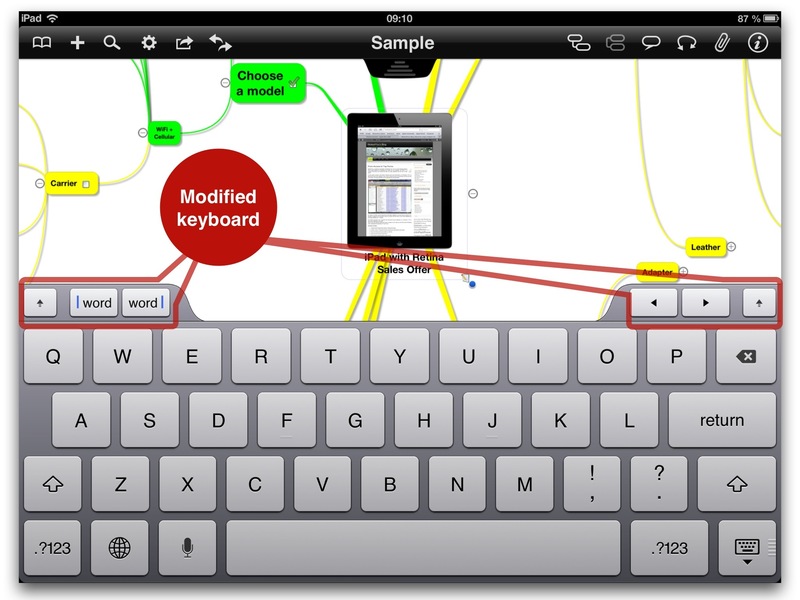 Craig Scott started developing his mind mapping tool already before the iPad was launched in April 2010. It’s not only an excellent coding but also a deep insight in what Apple intended to offer it’s customers. In his lecture about mind mapping on Biggerplate Unplugged (London 2013), Craig called it Touchy Feely Mind Mapping. People appreciate apps that feel as though they were designed expressly for the device. For example, when an app fits well on the device screen and responds to the gestures that people know, it provides much of the experience people are looking for. And, although people might not be aware of human interface design principles, such as direct manipulation or consistency, they can tell when apps follow them and when they don’t. in a perfect way. To use the app a documentation is basically not needed. For example there is one and only one taskbar which is divided into two parts. On the left side there are file management features and settings. On the right side you will find all features needed for editing a map. if it’s not usable then people will not use it. must play nicely with existing tools/services. mindmapping is what the app does. The result of following these simple rules convinces everyone and is the ultimate way to success. 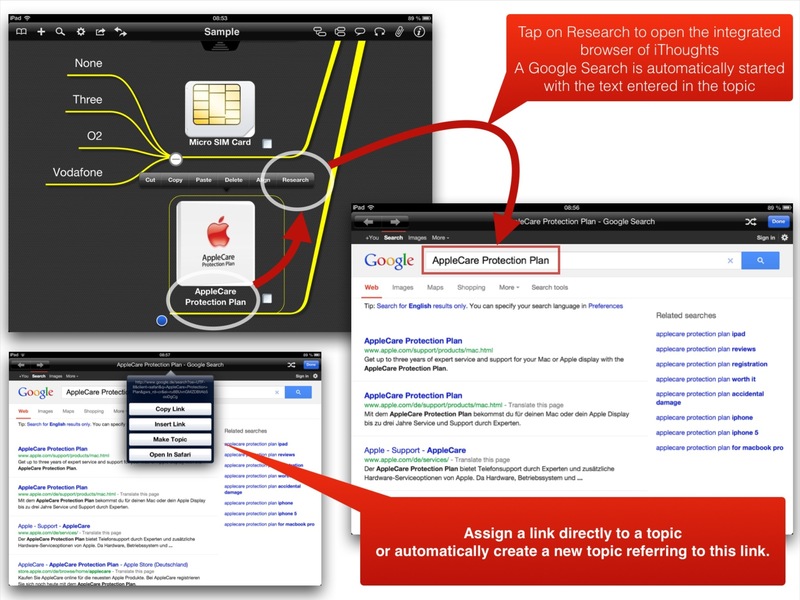 In many articles about mind mapping I always talked about iThoughts as the most powerful tool for the iPad. So it’s time to again review this app after all the useful updates it got over time. 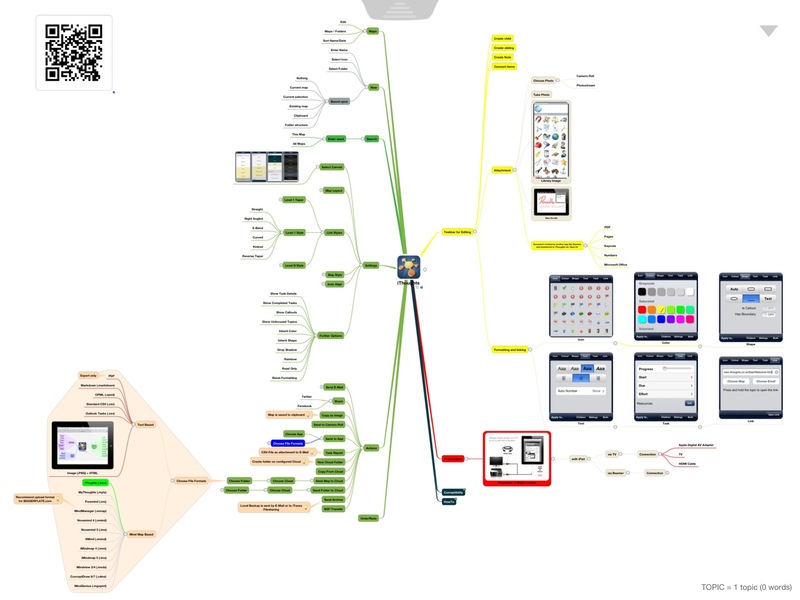 This mind map, created with iThoughts, shows all features of the app. I reworked this map in August 2013 after using this stability wonder for about 10 months. A mind map is worth a thousand words so I just want to describe some special and powerful features which let users create impressive maps and support sharing them in lots of different formats up to nearly all needs. Today nearly all kinds of information is accessible via Internet. It’s a giant knowledge base. 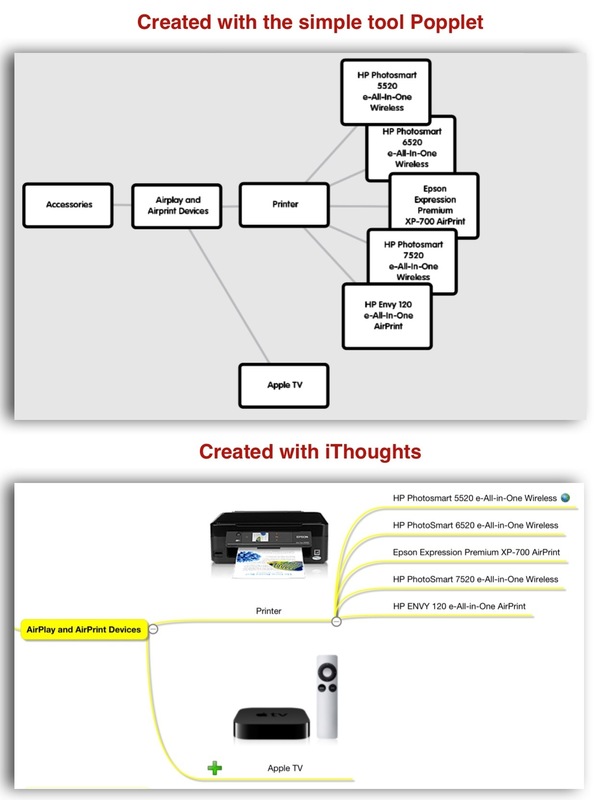 To provide background information from within a mind map iThoughts allows the assignment of hyperlinks to a node. When opening a link app switching between iThoughts and Safari is not necessary because of iThought’s integrated browser. This is an indispensable feature for mobile devices because of their One-Window technique. It’s also possible to seamlessly assign links to a topic by just tapping on Research in the context menu and using one of the options (Copy Link, Insert Link, Make Topic) offered in the browsers taskbar. Some maps are hard to understand because they often reflect a very subjective process of thinking about topics. To make it understandable for others it’s necessary to comment topics. iThoughts allows three ways of commenting. Do you recognize the sophisticated coding and design of this app? It often reminds me of basic values of Apple’s hard- and software, intuitive usage, limitation to useful features, and a UI without gimmicks. Commenting or even creating topics can be done with Siri, Apple’s speech driven assistant which can be started by just tapping on the small microphone button to the left of the spacebar on the keyboard. To create a sequence of topics use the word ‘comma’ which is interpreted as ‘create new topic’. 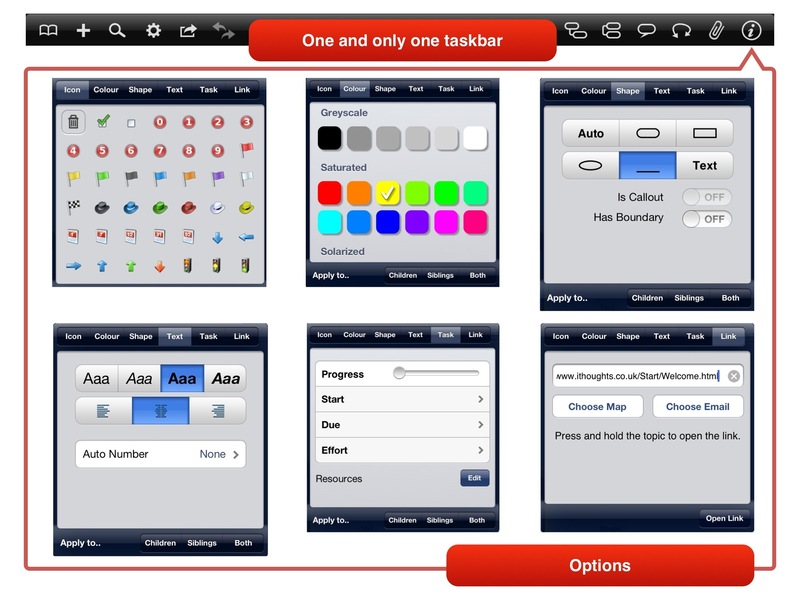 Craig allows to connect an Apple iWork document to mind map topics to breathe life into your mind map by assigning additional detailed information to that topic which cannot be provided by simple comments. Attached documents are stored in the mind map file in their native format. So you can delete the source file located in the documents folder of Keynote. You can also share the mind map including the iWork document. The recipient can then work on the mind map as well as on the attached iWork documents and send them back both, the map and the attached documents. 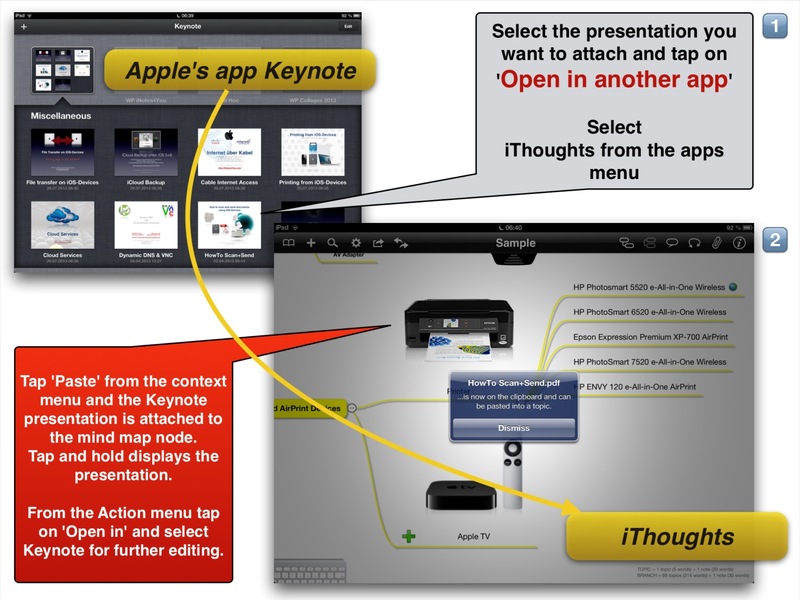 The marked topic contains the Keynote document icon as well as the note icon of iThoughts (right lower corner of the topic) which shows that additional information is available. Using ‘Tap and Hold’ the Keynote document can be opened to display the contents or to move over to Apple’s Keynote app to further work on it. With all our technical equipment some people unlearn using their fingers for painting and writing even if they use touchscreens every day, except me. See this my van Gogh-like doodle created with iThoughts and connected to the topic ‘Home Configuration’. Doodles are Vector Based which means that individual elements of the diagram can be selected, copied, pasted, moved and generally tweaked after the event. Doodles can be exported in SVG format – meaning that they can be opened and edited by apps such as Visio, Inkscape and Illustrator. Doodles can be copied to the clipboard as PNG images and pasted into other apps or emails. By selecting the relevant strokes of a doodle even parts of it can be copied to the clipboard as PNG. See the video on Craig’s website for detailed information. If you mark part of text within the integrated browser or any other app you may insert the text as a note, a topic, or several topics (if the the text is outlined). All formatting attributes are automatically stripped off. Topics with sub-topics are created if sub-items are separated with commas. iThoughts can generate a static PNG (image) export for each map. The PNG can be emailed as an attachment or uploaded to one of the ‘cloud storage’ services (Box, Dropbox, or any other cloud accessible via WebDAV like iDriveSync). iThoughts can also generate (and email/upload) an associated HTML page. The HTML page contains what is known as an Image Map. This makes it simple to publish a static, clickable mindmap webpage. As an example – take a look at the following link – generated by iThoughts and uploaded to Dropbox then made publicly visible – essentially using Dropbox as a website hosting provider. Create your map – adding links to topics as appropriate. 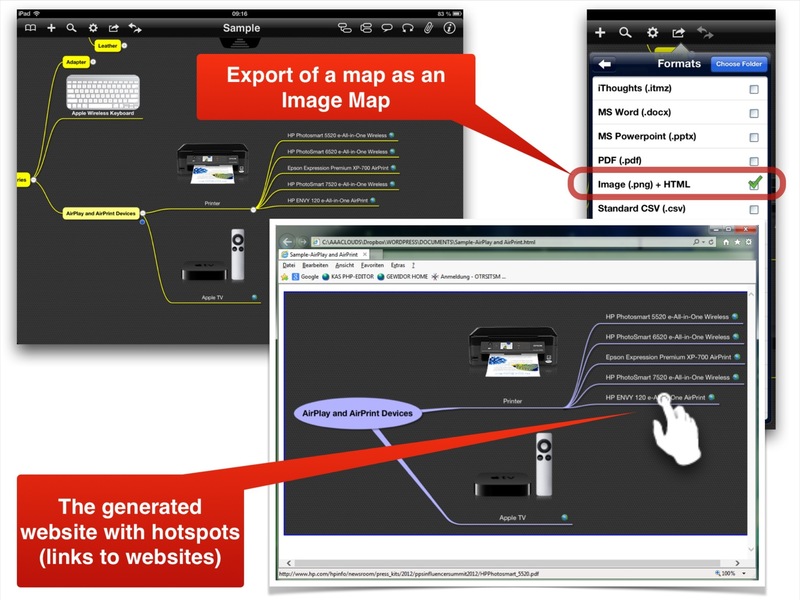 Select ‘Send Map To Cloud’ and choose the PNG+HTML export format. Choose a folder to upload the PNG and HTML file into. That’s it – your map is now published as a clickable web page. 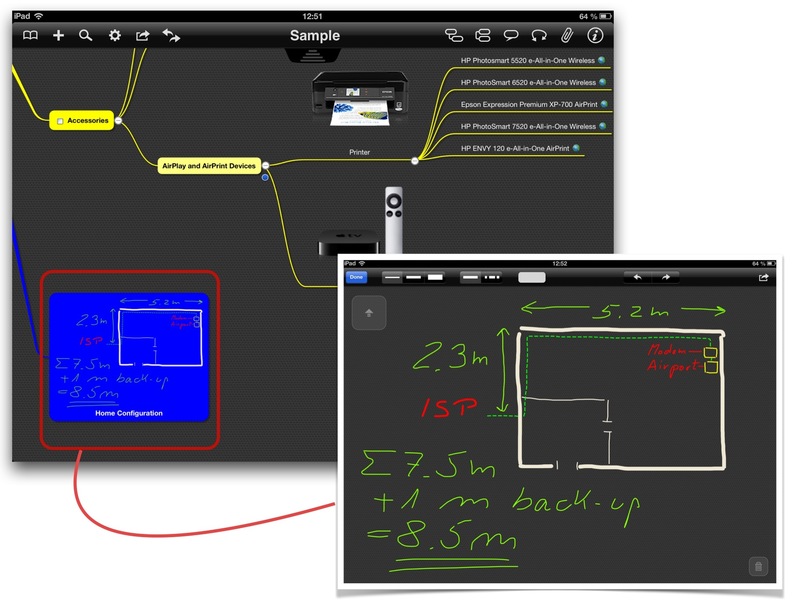 If you’re using Dropbox then you can use the built in iThoughts sync to refresh the image/HTML as you map changes. Image maps on websites act as attractive navigators. People are much more about to retrieve information than with traditional link lists. iThoughtsHD automatically saves your work every 60 seconds (or when the app is closed/suspended.) It also creates a ‘snapshot backup’ (copy) of your map each time it is modified then closed. It keeps 10 previous snapshot versions (of each map) on disk – any one of which can be recovered. To recover a previous version, you must create a new map and select the ‘Based Upon’ option and choose the map and version which you want to recover. Mind maps can drastically improved by using adequate connectors, colors, shapes, images, numbering, and size of topics. Be aware that using an appropriate usage of all the offered attributes attracts an audience, forces further discussions about topics, and last but not least remain in the peoples photographic memory for a longer time compared to a more simple layout. File formats of mind mapping tools are unfortunately not standardized. Every developer of mind mapping tools knows this. However none of the many tools pay attention to this fact by implementing adequate options to save a map in all the well-known file formats of other tool, except iThoughts. If you want to become a mapper you should register on BIGGERPLATE.com to access more than 50k mind maps and to upload your own maps to this work-wide largest mind mapping platform. 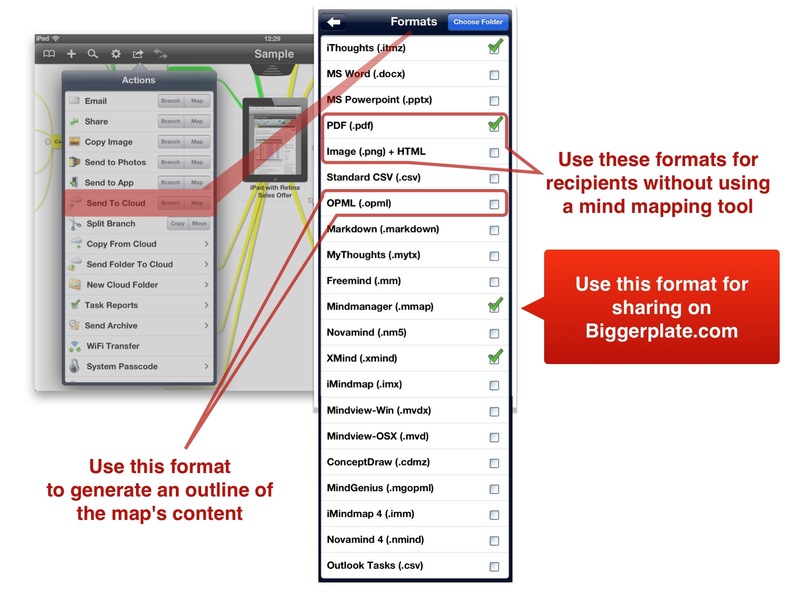 When downloading a map from Biggerplate you get the best results within iThoughts if the original map was uploaded in mmap (Mind Manager) format. By the way, a direct access to Biggerplate is a built-in feature of iThoughts. Just tap on the action’s control, use Copy from Cloud, and select Biggerplate. If you use the PDF or PNG format your map is automatically resized independent of the actual display on your device. Collapsed and expanded topics appear as on the screen. Complex maps need much space so that you have to limit expanded topics to the most important ones. Otherwise details will be too small to perceive. As an alternative iThoughts allows to export single topics and you may use this feature to seamlessly display important parts with a suitable resolution. It’s in the line of Craig’s sophisticated coding to add useful features to Apple’s standard keyboard for writing text in shaped topics. This is what makes mind mapping and the usage of mobile devices so fascinating. In the morning of August 10 I read Liam Hughes article about the Biggerplate Unplugged Conference in Utrecht (Netherlands on October 9, 2013) on my iPhone in a coffee shop. Biggerplate is the leading free mind map library founded by Liam Hughes, UK. Liam regularly organizes meetings with the leading heads of the scene. Coming home all the screenshots already arrived on my iPad (thanks to Apple offering photo stream syncing via iCloud). I cropped the screenshots (built-in function of iOS), opened my mind mapping tool iThoughts HD, and attached these photos to a new mind map, set some colors, and moved the topics to an appropriate position by using the gesture ‘Tap and Hold’. Additionally I used the app Prizmo (it’s not the mobile version of Prism!) with which text can be extracted from images by text recognition algorithms (see photo). I added the extracted text of Liam’s announcement to the comment field (top of the screen) of iThoughts to show an alternate way of attaching textual information to a topic which just contains a photo. A nice feature of iThoughts is that if a topic contains an image it can be displayed in full-screen mode by just tap and hold on a topic (see photo of Hans Buskes). for detailed information about text recognition. Now you may understand my introduction where I compared Steve Jobs with Craig Scott. Reviewing all the sophisticated features of iThoughts described here (and there are many more) support the perception of a powerful app in the line of many basic principles also followed by Steve. and a big Thank You for visiting iNotes4You.